They've been denied a spot just two years after organizers made the groundbreaking decision to allow gay groups to participate for the first time. BOSTON: A gay veterans group said Wednesday it has been denied permission to march in this year's Boston St. Patrick's Day parade just two years after organizers made the groundbreaking decision to allow gay groups to participate for the first time. The veterans group, OutVets, said on its Facebook page that the reason for the denial is unclear, but "one can only assume it's because we are LGBTQ." The South Boston Allied War Veterans Council, the parade's organizer, drew immediate condemnation from Boston Mayor Marty Walsh, who said he would not participate in the March 19 parade unless the council reversed course. "I will not tolerate discrimination in our city of any form," he said in a statement. Republican Gov. Charlie Baker said he would not participate either, while Democratic U.S. Rep. Seth Moulton called for a boycott of the parade. Moulton, who served four tours of duty in Iraq, has marched with OutVets previously. Restricting a veterans group from marching in a parade that honors veterans "doesn't make any sense to me," Baker said. This year's Chief Marshal, Dan Magoon, the executive director of Mass Fallen Heroes, resigned over the vote. "The freedom that we possess to hold such an event as the St. Patrick's parade is due to the men and women who have spilled their blood in defense to this great nation, regardless of their race, religion, gender or sexual orientation," he said in a letter to the council. Democratic State Sen. Linda Dorcena Forry, whose district includes South Boston, asked the council to reconsider. The vote left OutVets leadership stunned. "It's disgusting and disgraceful that they would do this to their own, because we are veterans like them," said Bryan Bishop, an Air Force veteran who founded OutVets. The council gave no reason for its 9-4 vote, Bishop said. Emails and several phone messages seeking comment from the council were not immediately returned Wednesday. Council member Ed Flynn said he voted to allow OutVets to participate in the parade through the largely Irish-American neighborhood, which in the past has drawn as many as one million spectators. "I am saddened and outraged that the Allied War Veterans Council has voted to turn back the clock on equality," he said. He called on the council to hold an emergency meeting to hold a new vote. OutVets has gone out of its way to conform with the parade's code of conduct the last two years, Bishop said. "If we did break any rules, we were never informed," he said. The only issue OutVets had with parade organizers was over use of their rainbow flag, he said. That issue was resolved. Bishop said he heard rumblings that OutVets would be barred from this year's parade as far back as November when Brian Mahoney, the former commander of the veterans' council, died. Mahoney had been firmly in OutVets corner. "The only thing I can assume is that with Brian no longer there to beat the drum for us they had enough support to put us out," Bishop said. 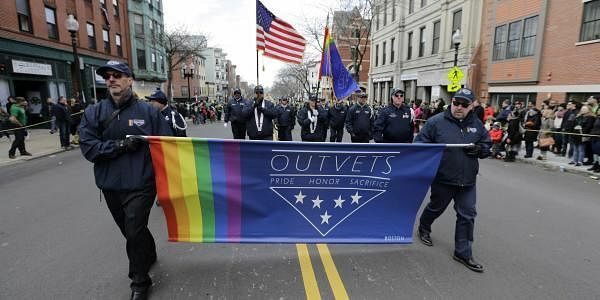 The South Boston Allied War Veterans Council's legal battle to keep gay organizations out of the parade went all the way to the U.S. Supreme Court, which ruled in its favor in 1995. "This is a black eye on South Boston," Bishop said.